Microservice architecture is a distributed system where multiple services collaborate with one another. They typically communicate with each other using REST API. However, all the services are prone to failure. It might happen due to various reasons like network latency, instance running out of memory. Thus in a typical distributed system, failure of any given microservice is inevitable. If a Service a fails, then other services which were directly consuming the APIs of Service A will also fail. This in turn will cause failure of the APIs of other services which were dependent on them. This is called cascading effect caused due to a failure of a single service. This might render a huge part of distributed system unaccessible or in worst case bring the entire application down too. Also debugging of the root cause in the distributed system is more difficult than simple monolithic applications. Netflix Hystrix is a circuit breaker implementation library which provides fault tolerance.It improves the overall resiliency of a distributed system and stops the cascading effect. In this article, we’ll explore more about Hystrix. Hystrix is a fault-tolerance library which implements circuit breaker pattern to improve the resiliency of distributed system, Before jumping into Hystrix, let’s first find out what exactly is circuit breaker design pattern. The basic idea behind the circuit breaker is very simple. Wrap a protected/remote function call in a circuit breaker object, which monitors for failures. Closed State: The circuit breaker continues delegating the calls to the underlying function and monitors the failures. Once the failures reach a certain threshold, the circuit breaker trips open. Open State: In the open, state the circuit breaker won’t make a protected call at all. Instead, it will route the call to fallback logic (if fallback is configured). The circuit remains in the open state for a certain sleep interval. After a certain sleep-interval where the circuit is open, it will again attempt to close the circuit to check if the underlying protected call can still be made. If it again fails, the circuit will again trip open for the sleep interval duration. This state is sometimes referred to as Half Open state. More information about the Circuit Breaker pattern is provided in this beautiful post. Hystrix provides the implementation of Circuit Breaker Pattern. It isolates the calls to other services, by wrapping them inside a circuit breaker object. This circuit breaker object acts as a proxy and routes the calls to underlying service, only when it’s closed. If the circuit is open, then calls won’t be redirected to underlying service. Instead, a fallback logic can be configured and all the calls will to route to it when the circuit is open. Spring Cloud integration available to integrate it with Spring Boot projects. Cricket Service - a microservice providing APIs for a cricket score. Notify Service - A client microservice which consumes APIs of Cricket service. We’ll be implementing the circuit breaker pattern here to examine how Hystrix handles failures in underlying cricket service. Eureka Server acts as Service Discovery which maintains the list of all the microservices as KEY-VALUE pair. Key is serviceId and value is the instance information (host, port). 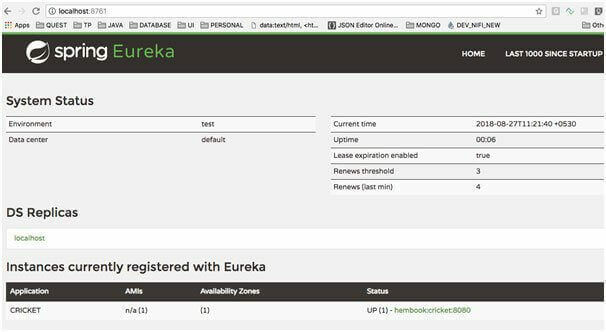 All microservices must register themselves on Eureka. 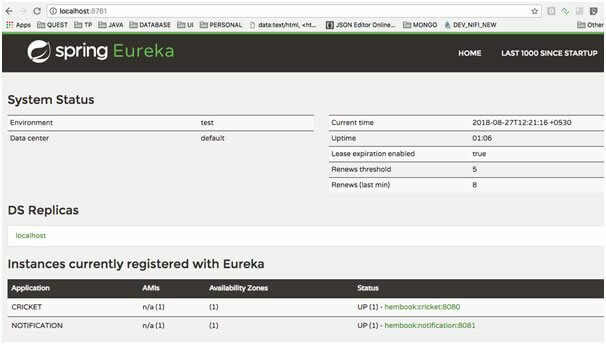 Enable Eureka Server by adding annotation @EnableEurekaServer on our main Spring boot application class. All the clients register themselves on Eureka. Since this is Eureka itself, it doesn’t need to register itself. FetchRegistry is needed for clients to get information about instances and cache it, hence disabled here. Currently no client is started, hence it’s displaying ‘No Instances Available’. This is a Eureka Registered microservice which exposes some APIs (currently about dummy cricket scores). The controller exposes API for the mock cricket match data. The following logs suggest that the application is started on 8080 And also registered on Eureka. Confirm whether its API is returning mock match data. Notify service is the 3rd microservice. It is Eureka registered service and further it consumes the APIs of the cricket service. However for API invocation of underlying cricket service, Hystrix is enabled. Spring-cloud-starter-hystrix - This dependency provides Hystrix support. 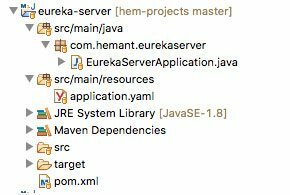 Spring-cloud-starter-eureka - This dependency provides basic Eureka Client support. The controller exposes endpoints which in turn consume APIs from Cricket service. The Hystrix configuration and the fallback logic is implemented here. 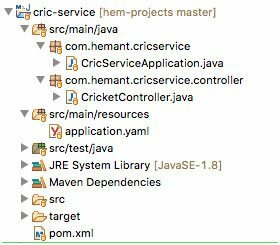 Here the method getMatchDetailsById which invokes underlying cricket service is annotated by Hystrix command. This method will fail to invoke when underlying service is down or unreachable due to network latency. In this case, normally the API of this service will fail too. But since Hystrix is in place, failures are handled gracefully. Upon any failure in execution of the method getMatchDetailsById, fallback method is invoked. The fallback method should be defined in same class and must have the same signature as the original method. 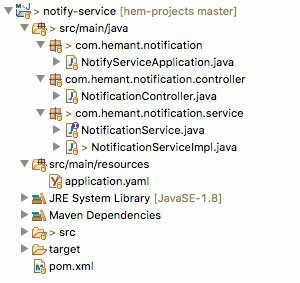 The @HystrixCommand, gets the remaining values from the application properties file. The service has serviceId as notification and will run on port 8081.
circuitBreaker.requestVolumeThreshold = 10 ->This property sets the minimum number of requests in a rolling window that will trip the circuit. circuitBreaker.errorThresholdPercentage = 50 -> If 50% of the requests fail in rolling window, then circuit will trip open. circuitBreaker.sleepWindowInMilliseconds = 10000 ->This property sets the amount of time after opening circuit, it will reject requests before reattempting to try if underlying service has recovered or not. Hystrix will observe the requests in rolling window of size 10. If 50% of these requests fail, then it will open the circuit. When circuit is open, Hystrix won't attempt to call underlying service and directly call the fallback logic. When this duration lapses, circuit breaker will close the circuit and check if underlying service has recovered or not. If Still NO, then it will open the circuit again for 10s and route all calls to fallback before retrying again. The following logs suggest that the application is started on 8081 And also registered on Eureka. 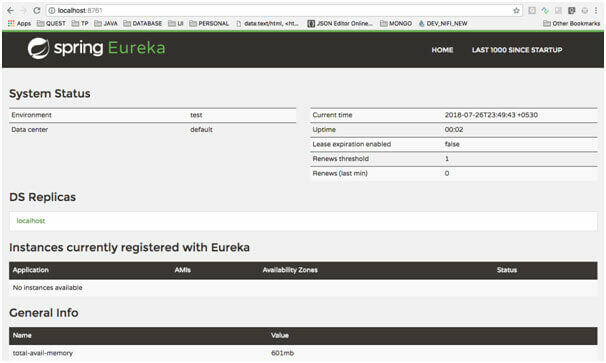 Upon checking Eureka dashboard, we should see the instance available. Since all applications are up, on invoking the API of notify service, the underlying cricket service should be accessible. This implies the circuit is closed as all seems well. Now shutdown the instance of Cricket Service and try accessing the API. From the logs it’s evident that call to main method failed and Hystrix invoked the fallback method in response. Since fallback logic was invoked the API returned with 200 OK (with data from fallback logic). This avoided the cascading effect of failure of a service. Make quick attempts to hit the API In this case, once the circuit is open, then it will keep it open for specified sleepDuration (in application its 10 sec). In this duration, it will simply redirect to fallback logic and not try to invoke underlying API. Try accessing the URL after 10 seconds When we try accessing the API after 10 sec, since sleepDuration has expired, Hystrix will again attempt to connect to underlying service. However since cricket service is still down, it will fail and invoke the fallback logic and again trip open the circuit for next 10 sec. The response still remains same as in Step 3. Now restart the cricket service and try accessing notify service API. Once the service is started and the sleep duration of open circuit expires, then Hystrix will again attempt to invoke underlying service and will succeed this time. Thus returning proper service response. Thus we have successfully added resiliency in our distributed system by implementing Hystrix circuit breaker. If though underlying service is down/not accessible, Hystrix allows APIs to continue to perform by invoking the fallback logic. This ensures graceful degradation of microservices in case of failure. Also this avoids the dreaded cascading effect of failure. Note that the code shared by Expert Java Application Development team is for reference reason only. If you have any doubt or need to ask anything related to the issue, make remarks below.